Using substrate resonators, the performance of a SQUID can be greatly enhanced. A standard SrTiO3substrate with dimensions 10 × 10 × 1 mm3 serves as a tank circuit (resonator), a YBCO thin film SQUID washer structure is patterned on it. 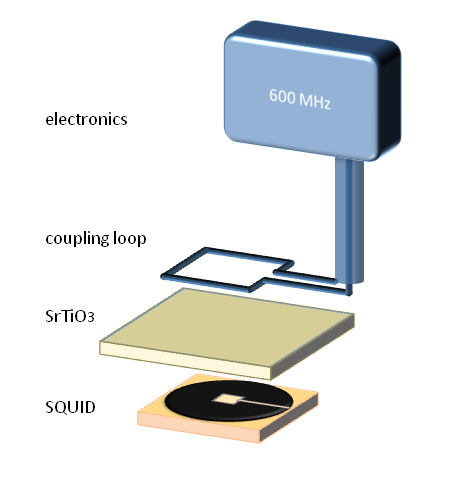 On the resonator substrate, a small rf washer SQUID with a step-edge junction is positioned in flip-chip geometry, thus forming a magnetometer sensor. At 77 K, the field sensitivity of this SQUID magnetometer reaches 24 fT/root(Hz) in the white noise range.